Saintbury was founded in the 12th century. 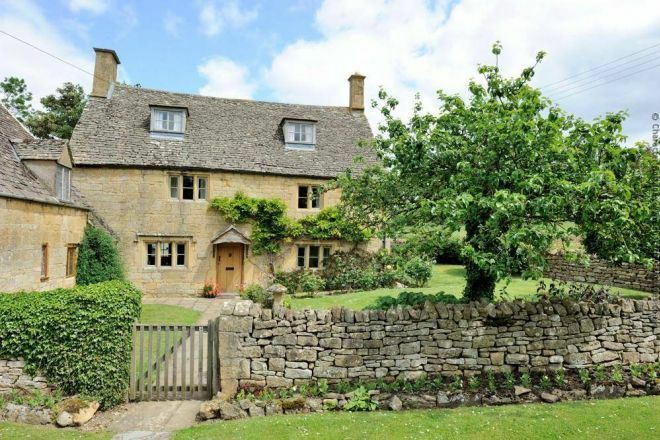 In Kelly's Directory of 1923, Saintbury was described as a village and parish, 3 miles south from Honeybourne station on the Great Western railway, 30 north-east from Gloucester and 3 miles west from Chipping Campden. 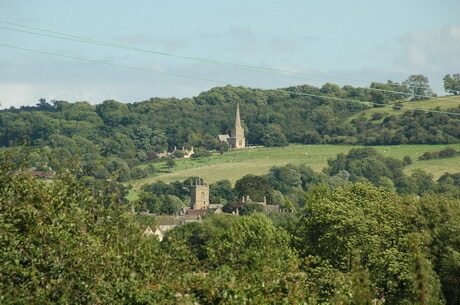 When you stand and look at the view from St.Nicholas' Church you are on the north-western edge of the Cotswold oolitic limestone hills. Looking west the land falls away to the Vale of Evesham and beyond to the River Severn. This flat land with its deep loam soils, by way of Willersey, Childswickham, Aston Somerville and Sedgeberrow is a fertile bed, which has yielded fruit, vegetables and honey for centuries. In 1712, Saintbury was recorded as having 54 houses with a population of 200 and in 1762 31 houses and a population of 138. As of the 2011 census, it had 151 houses and a population of 278 of which 142 were female and 136 male. Notice the decline in the number of residents per house. The name Saintbury is thought to come from Swain meaning villager and Bury meaning hill or Burth meaning fort, which given the village's age and hillside location, makes perfect sense. The Church of St Nicholas is described as “a building of stone in the Norman and later styles, consisting of chancel, nave, transepts, north porch and a tower with a spire.” The east window retains some ancient stained glass, representing St Nicholas. It was restored 1907-1913. The parish records of baptisms date from 1561, of marriages from 1585, and of burials from 1603. The living was then a rectory in the gift of Capt. H.C.J. Alston-Roberts-West, R.N. and had been held since 1900 by the Rev. Richard Muriel Nason M.A. of Magdalene College, Cambridge. 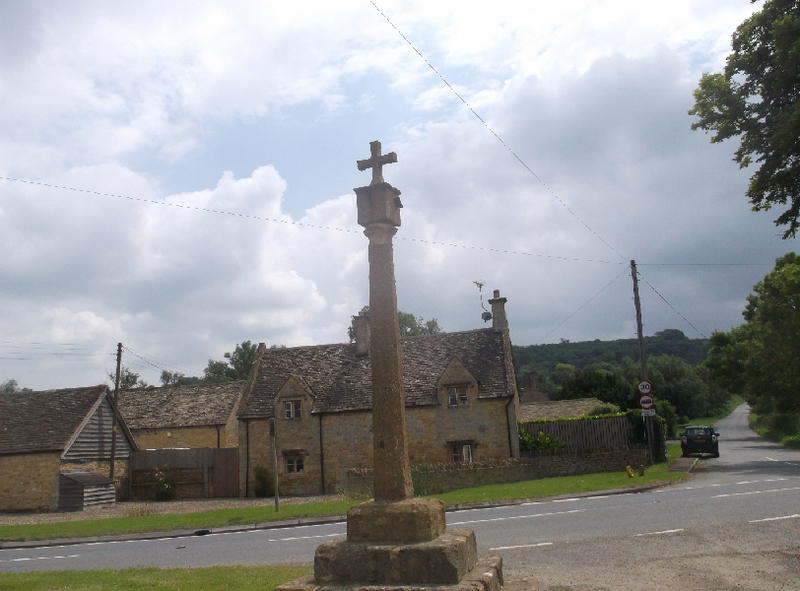 There is an ancient cross at the bottom of the village. 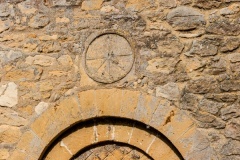 The church's earliest known feature is a sundial considered to be 11th century. The early finely carved box pews are an 18th century addition and there is a notable collection of 17th and 18th century ledger slabs in the church. Sadly St Nicholas's Church last service was in 2009, and since Lady Day in 2011 it has been in the care of The Churches Conservation Trust, which currently preserves 347 churches countrywide. For opening times, please telephone 0117 929 1766 before your visit. In 2013 a number of paintings dating back to the 1630s were found for the first time in 150 years. They were probably limewashed over in Victorian times and consist of detailed biblical texts surrounded by an intricate border. 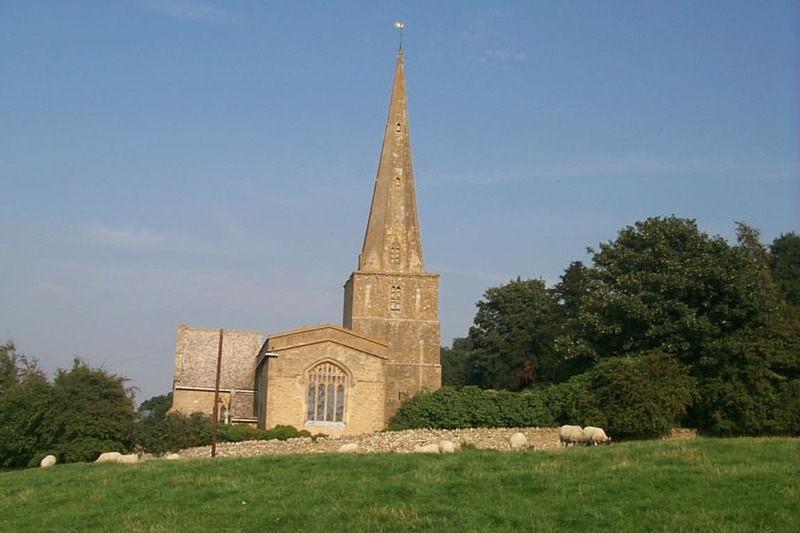 This Grade I listed medieval Church is near to the Cotswold Way footpath and has a tall and slender spire, which can be seen from all around and is a really notable landmark. It has a quiet graveyard which is a really superb place for quiet contemplation. There are some interesting early post-medieval wall paintings in the chancel and visitors may also be interested in the Arts and Crafts features that were added in the early 20th Century, including the chancel and north chapel ceilings; the north chapel screen (c1904 by Ernest Gimson); the north chapel reredos (c1920 by Alec Miller) and the Chancel chandelier (1911 by Charles Ashbee). The Cotswold house called Latimers in Weston sub Edge has been both a theological college and an inn. It was also the family house of William Latimer, a Reformation scholar and translator of international reputation. As well as at Oxford and around London, the Reformation was also born in the country houses of the Cotswolds. He asked to be buried in Saintbury churchyard in 1545 and is now in an unmarked grave overlooking the Vale. William Smith, Saintbury parish clerk and roadmender in the early 1900s had played in Church orchestras before the use of organs and harmoniums. His life is well documented in Gissings Footpath Way in Gloucestershire. Gissing recalls amongst other stories that Smith chopped up the village stocks for firewood. The route taken for funerals was commonly called a “corpse way” in this area, and on these routes we often see the motif of resting the coffin at a crossroads. At this crossroads the coffin bearers would change positions, which may be a form of the ritual reversal often connected with forging links with the otherworld (which is why, perhaps, suicides were often buried upside-down), the concept being that the land of the dead was much like ours, but with everything reversed. The purpose of all this was probably to ensure that the soul left the body so it would not later rise from the grave.If you favour the theory that crossroads confuse spirits, then the point would still appear to be to disentangle the spirit from the corpse by losing it at the crossroads. Saintbury Cross is at a crossroads downhill from the Church. 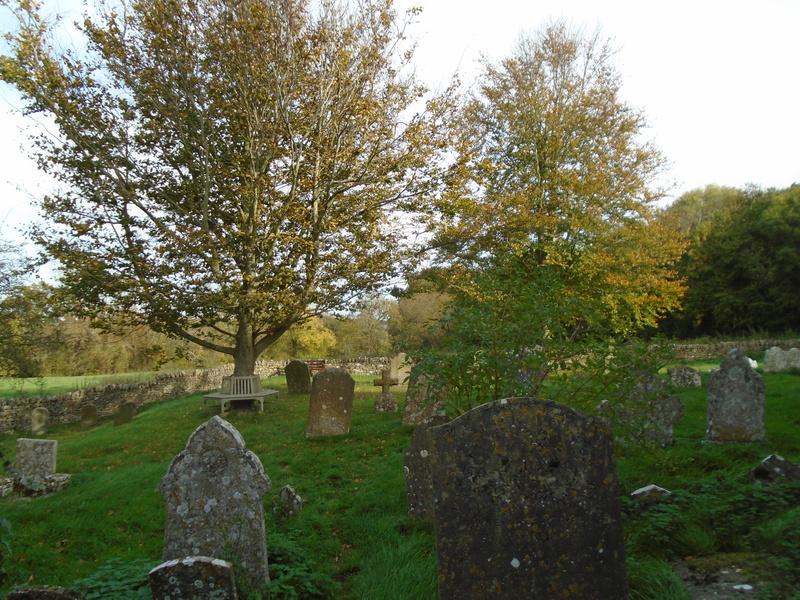 It was used as a resting place for funeral processions before they started their way up the hill to Saintbury church. Most of the original Saintbury houses were separated from each other by twists in the hillside. You also had to be quite fit to live there as outside the house you would often be walking up or down hill. In 1910 most houses had cowsheds under the same long roofs as the farmhouse so as to keep everyone warm in the winter. Henricus Bagley me fecit 1678, Henry Bagley made mee 1678, John Freeman and William Hobbs Churchwardens 1678. In 1999 two trebles were added by the Whitechapel Bell Foundry of London. It is possible to hear both the bells at St Nicholas's and St Peter's Churches in Willersey. Maybe one day they will provide a stereo peal! On Sunday 19th July 1983 at 3:00pm the bells were re-dedicated in a service conducted by the Archdeacon of Cheltenham, the Venerable Thomes Eric Evans MA. The local vicar can still conduct two to six services a year as well as baptisms, funerals and weddings. If you are on the path leading to the Village Stores in Willersey heading towards The New Inn, you can just see the spire of Saintbury Church nestling on the hills between the two houses opposite. 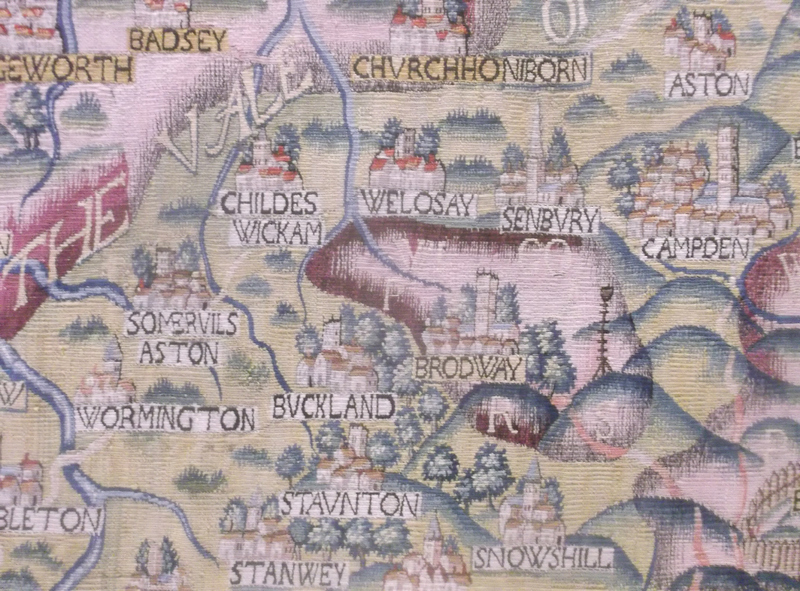 On this 16th-century Sheldon Tapestry map of Worcestershire and surrounding counties, Saintbury is spelt Senbury. The name Saintbury is thought to come from Swain meaning villager and Bury meaning hill or Burth meaning fort. The family name Sainsbury originated in Saintbury. Saintbury has a single postcode which is WR12 7PX. Spelling variations in place names were frequently found historically in England. Some of the spelling variations of Saintbury are Seinebur, Swineburie, Swainsbury and Seineburia. In the 12th century it was recorded as Seynesbury. Those whose names are recorded on the Saintbury War Memorial are commemorated at the Remembrance Day Service in Willersey. Saintbury cemetery is a peaceful place high up on the Cotswold escarpment with views over the Vale of Evesham and beyond. Saintbury War Memorial has been severely battered by nearly 100 years of weathering. Its single upright pillar heavily eroded, its ornate, stone top with Christ Crucified in danger of dropping off and the names of the Fallen so worn as to be unreadable. We promised we would remember them so that their name liveth forever. We must find the money to restore this lasting memorial and I hope that you will contribute to help make this happen. Please make your donation for the restoration of the War Memorial in Saintbury Churchyard by cash, or by cheque to St. Peter's Willersey, PCC, marked “Saintbury Memorial Fund” on the back, to Judith McNeil-Wilson, PCC Treasurer, The Granary, Main Street, Willersey, WR12 7PJ. Thank you. St Peters in Willersey with St Nicholas' in Saintbury behind. These videos will give you a good picture of the local countryside. In some fields you may notice quite large ridges and furrows. 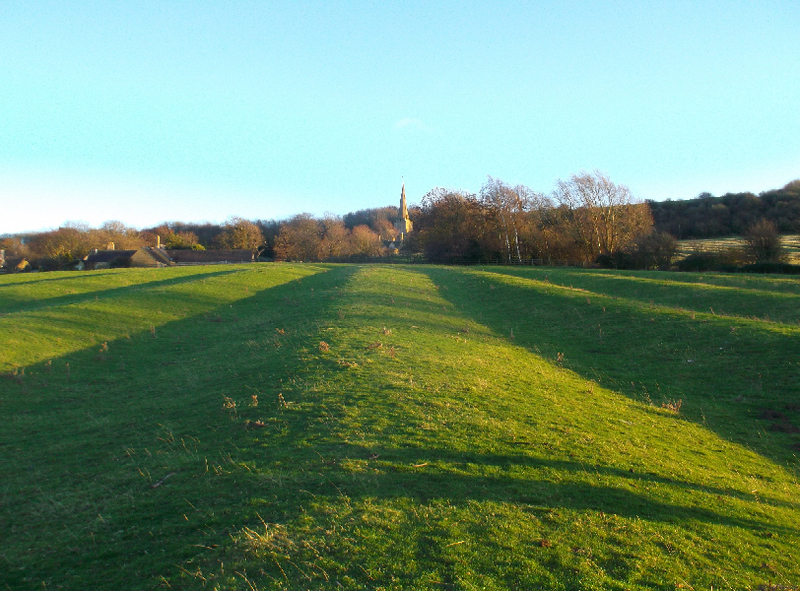 Ridges and furrows highlighted at sunset with St Nicholas' Church in the background. In Anglo-Saxon times, families owned strips of land with their neighbours farming adjacent strips. Traditional ploughing with a single furrow plough turned the soil over to the right so as there was no point in the plough returning doing nothing along the same furrow, ploughing was done in a clockwise direction around a long rectangular strip of land. After ploughing one of the long sides of the strip, the plough was lifted, moved across the unploughed headland and then put back in the ground to go back down the other side. Over time soil was moved towards the centre line thus creating the ridges and furrows. Sometimes the ridge has a slight “S” shape as the ploughman was always fighting to keep the plough straight given its asymmetrical shape. The length of the ridge was often determined by the work that a team of oxen could do before taking a rest. These ridges also had the benefit of increasing the available soil area slightly as well as improving drainage since most ridges are aligned down a slope. It can be hard work walking across a series of the deeper ridges and furrows and some furrows can be quite boggy, even in dry weather. Saintbury Cross on the B4632 road at the bottom of the village.
. The lower section of the cross at the junction of the Saintbury and Willersey to Weston-sub-Edge road dates from about 1400 and is 11 feet high. The Maltese cross and sundial on top were added in 1848. 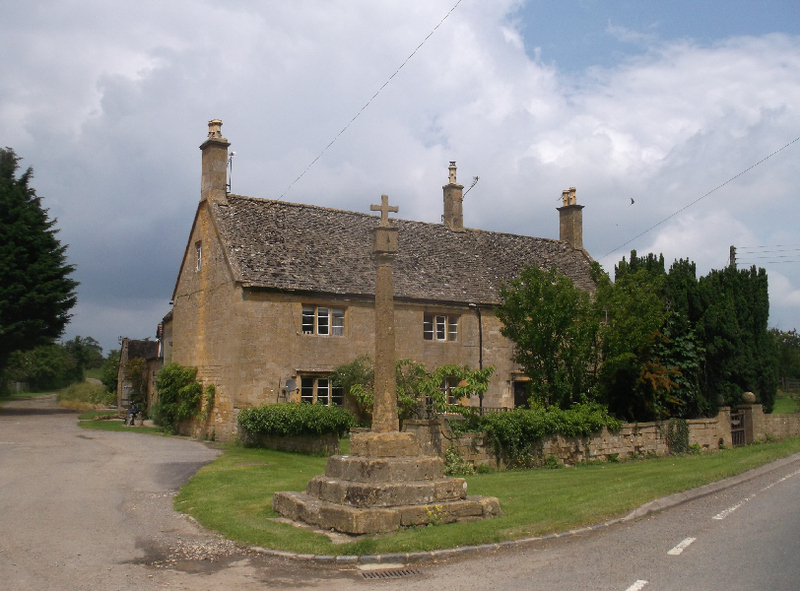 Many Cotswold villages have similar crosses. The sundial is an unusual design. Because it is vertical, rather than horizontal, the shadow forming shapes (gnomons - good scrabble word?) are distributed around all four faces of the cross. Pillar dials like this one usually carry three or four vertical direct dials to ensure coverage throughout all daylight hours. Saintbury Church has a Saxon sundial. As it is built on the side of the hill with the main entrance on the north side, one has to climb further up the hill to see the rather inaccessible south side on which a vertical sundial had to be placed. The Saxons chose this location. 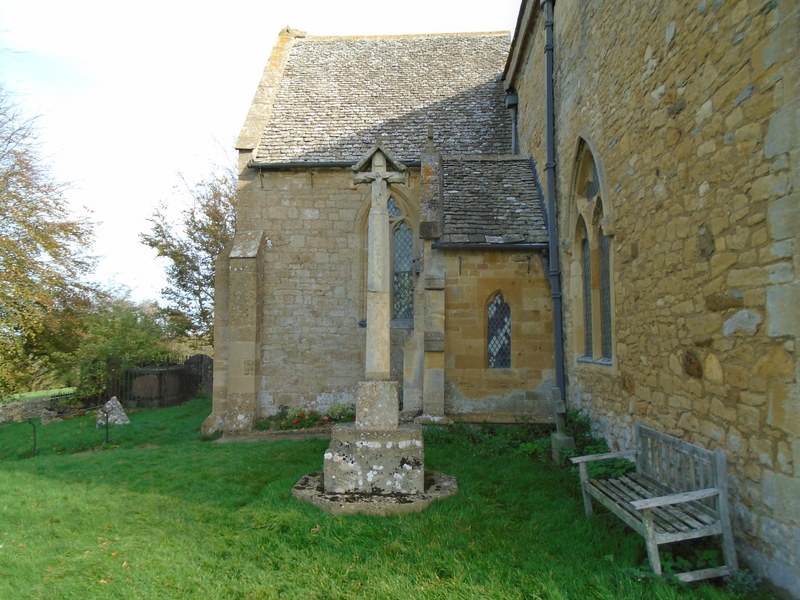 As it was normal in the 19th and 19th centuries for churches to have sundials, usually one was placed in the churchyard, but at Saintbury the pillar dial was eventually put at the nearby road junction. Sundials used to play an important role in regulating daily life in the UK. The study of the construction of sundials, or the 'Art of Dialling', was a part of a good education. Only with modern communications and the extreme accuracy of modern clocks has the sundial been eclipsed (pun?) as a scientific instrument. They still however give good readings as they don't need battery changes or winding up! Why do our clock hands go in the direction they do? When sundials were the usual way of telling the time the shadow went around in a certain direction and the same direction was naturally adopted when the first clocks were given hands and faces.
. This figure in the Church seemed promising as a Sheel na gig but does not have all the required features. 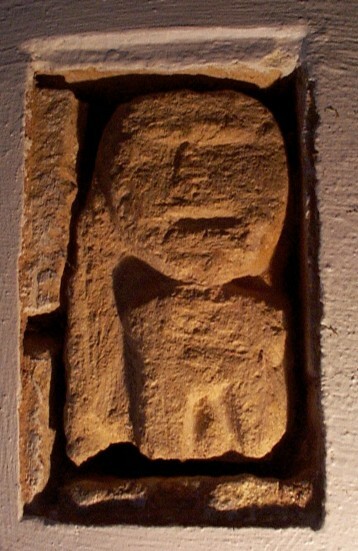 It is however obviously very old and does have certain sheela type characteristics such as the large head. Although no longer based in the area, The Saintbury Trust is a medium-sized grant-making registered charity which seeks to help charities in its geographical area of the West Midlands, Warwickshire, Worcestershire and North Gloucestershire. A major part of its interest is in Birmingham itself and around Worcester. The Trust's interests are wide-ranging but the trustees have a particular interest in the arts, heritage, the environment and helping those with disabilities. The majority of the grants awarded are either £1,000 or £2,000. Relatively few exceed £5,000. The Miss Nash Trust Fund gives grants to Willersey Village Organisations. Written requests should be made to Mr Phil Bennett, 2 Ley Orchard, Willersey, WR12 7PW. 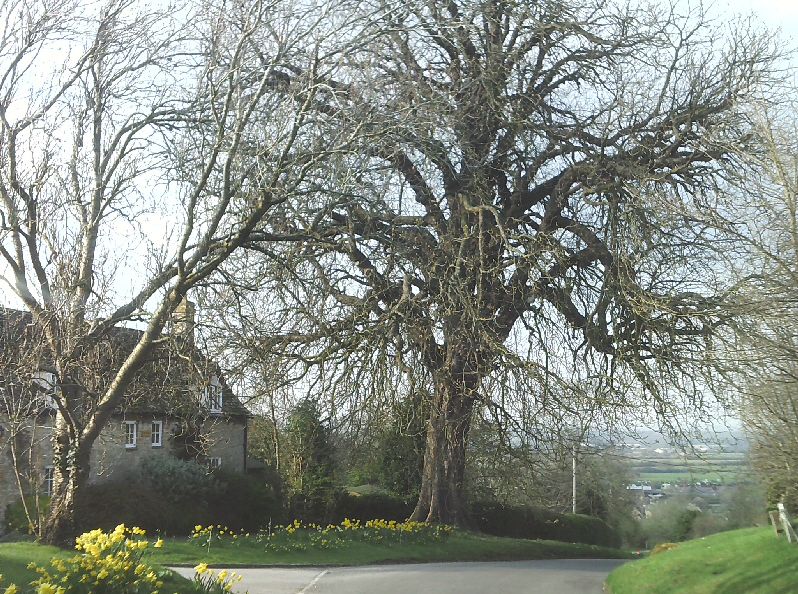 The Chipping Campden Community Trust started in 1995 and covers not only Chipping and Broad Campden but also Mickleton, Aston, Weston-sub-Edge, Willersey, Saintbury, Ebrington, Charingworth and the Hidcotes. Its principle aim is to enable older people to remain at home when possible and to lead active and productive lives. It also has limited, unrestrictive funds to support individuals and groups where no offical support is available. Contact the Secretary Sue Roberts on 840351 or the Chairman Tony Rose on 840625 for more information. The Trust is providing dementia day care every Thursday fortnight in Mill house, Chipping Campden. If you know of someone who could benefit, please call Kirsty Holder or Bridget Salvage on 01608 652019. The Trust also ran a falls prevention presentation in Willersey Village Hall.